How could I resist making this week’s assigned French Fridays with Dorie recipe? ( As you can see, I didn’t!) I especially couldn’t resist this latest FFWD recipe for a peach sundae created by Auguste Escoffier for the nineteenth century opera singer Nellie Melba. Taking the fascinating history of the first peach melba aside, this is still one unique combination of flavors in a very creative sundae that has stood the test of time. Peach melba, while not a typical offering in an American ice cream shop is fairly easy and fun to make, maybe it’s the effort that goes into poaching the peaches that keeps it off the menu(?) I remember sharing a banana split but never a peach melba, we always went for the banana splits, more ice cream- plus banana- plus chocolate sauce. I placed all my ingredients (mise en place) on the counter and went to town putting together, from the sweet poached peach bottom to the toasted slivered almond tops, my first peach melbas. First I nestled a small (petite) scoop of raspberry sorbet on top of my peach half resting on a spoonful of it’s poaching liquid. Then the real fun began as I added fresh raspberries around the sides of the peach, mostly to keep the peach company but also because I like raspberries. I spooned a generous amount of crème fraiche over the sorbet and then went to work dousing the entire concoction with fresh raspberry sauce, fortified with a good shot of cassis- which does bring out the raspberry flavor as well as add it’s own personality to the peach melba. Then with a slight flick of the wrist I topped my sundae with toasted almonds. Just imagine the joy we experienced spooning into these peach melbas after dinner tonight, thank you Dorie for another sublime recipe. 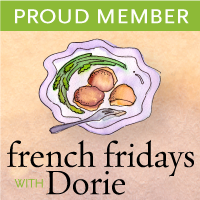 Please check out the other contributors to French Fridays with Dorie, an online cooking group celebrating 100 recipes made from Around My French Table this week. Please find a link to the Peach Melba Recipe at- Baking with Dorie: End -of-Summer Sundae. I’ve never tried Peach Melba but this is so beautiful – I know I’d love every bite! Patty, I really enjoy your recent posts…all with fresh seasonal produce and so colourful and pleasant. This peach melba looks delightful! French Fridays with Dorie has put me in contact with a lot of talented bloggers. Your creations and stylings have been inspiring. Cheers. that red colour is just so vibrant and beautiful!!! everythign about this dessert is just beautiful!! This is so pretty! I used Greek yoghurt instead of cream – I can only imagine how awesome crème fraîche would be! Just gorgeous, Patty! This was one was easy to really enjoy!! Loved those poached peaches…so good! As always a beautiful presentation! Happy 100th! It’s been a pleasure getting to know you!! What a pretty dessert! It makes me a little sad that summer is on its way out. However, I do enjoy Fall and we are lucky in the Bay Area that we get the Indian summer and it seems to prolong summer. Lovely photos Patty! Hope you have a great weekend! Happy Friday!!! The Peach Melba looks lovely and delicious. Happy 100th. That is so gorgeous and colorful! It’s a perfect summer dessert, and yours turned out beautifully. Fantastic pics of a wonderful dessert! I like the idea of using raspberry sorbet, I like water based so much more than cream based ice creams. I love your new look Patty (I already told you that, I know..) Have a great weekend! It’s hard to believe we’ve reached 100 recipes already – your blog was one of the many happy discoveries I’ve made by joining French Fridays. Love your description of making this, an elegant execution as well as presentation. I had never made peach Melba before, and I have to say that I was wondering whether the various steps would be worth it. However, the answer is a resounding yes – so delicious. A little bit of alcohol doesn’t hurt either Yours is like a work of art – so pretty. This is so beautiful….I like this wonderfu color sweet. So pretty and delicious looking, Patti. I always know there’s going to be something wonderful when I click on your site and today is no exception! Patty, You are right. This is just not a day-in-day-out American dessert like a chocolate sundae or a banana split, and the like. I probably have had Peach Melba 5 or 6 times in my life and have always thought of it as a rather elegant dessert. I had never created it myself until now. You also are right about the many processes scaring off the rushed American cook (male or female). All the processes seem toooooo much to fit into our busy days, perhaps. Like you, I felt the intense flavors and the enthusiasm of my “taste-testers” made Peach Melba a dessert worth the effort and making more often. Dorie’s directions were so clear. I just have the feeling that when Ray, Dominick and Glenn, (my tasters) come to my house for dinner, they will be expecting Peach Melba, no matter what the season. Your raspberry sorbet interested me also. 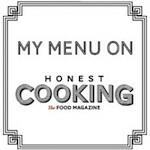 Happy 100th Recipe – I have some catching up to do. Looks like a lovely refreshing dessert for a hot Summer day! Oh wow Patty, I love peach melba! I remember having a difficult time when I was young, whether to get a banana split of peach melba. I usually get someone to split the banana split with so I can order a peach melba for myself. LOL! I think I would like to try your version while peaches are still in season. Love this one! Speaking of banana split, did you know today was National banana split day? Just gorgeous, as always, Patty! Your peach melba is absolutely superb, and gorgeous! Love this classic dessert which I have not made for a long time! Just drooling over the photos! I’ve been having such a hard time connecting to the Internet in the last couple days…especially all day, today. Tropical Isaac is keeping me all day inside, heavy rain and tremendous wind right here on the beach where I live! I always learn something new from you Patty! This desert looks so satisfying, I could just reach through my screen for a bite. Oh I wish! I saw someone’s Peach Melba the other day and that was my first time seeing this dessert. How delicious and light. I don’t have many peach dessert recipes, so this was very exciting recipe for me. Very beautiful presentation Patty! So pretty, Patty. I miss doing French Friday’s. Your post was so much fun to read. Now if I could only somehow reach in and take a bite…! I can understand not resisting making this–looks beautiful. I’m with Lisa, too. I’m glad we have our Indian summers that allow us to enjoy summer treats like this. I must not have been here in a while. I love your blog’s new look. Wasn’t the peach melba amazing? I loved that you used sorbet instead of ice cream, so much fruitier. Happy 100th recipe, Patty! I’ve enjoyed getting to know you through these recipes, and the others that you make. Your creativity and artistic presentation are inspiring. Thanks Betsy, Happy 100th recipe to you too! Gorgeous, what a refreshing and delicious treat! Peach Melba has been a favorite of mine since childhood, and this gorgeous beauty reminds me of it! So lovely Patty!